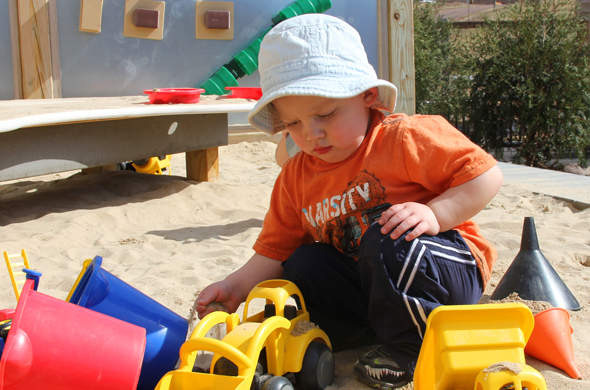 The Toddler program provides care for children 18 months to 3 years of age. The staff to child ratio is 1:5 with a group size of 10; and 1:4 with a group size of 12. The daily schedule allows time for indoor and outdoor play; diapering/toileting, napping, and relaxed family-style meals. The staff are caring, affectionate, and positive in all aspects of caring for children. they are always involved and guiding children’s play. Children learn best through play. We use The Creative Curriculum as a guide for planning and assessing children. There is a variety of activities available throughout the day, including art, music, singing, dancing, sensory, science, language, gross and fine motor, math, and social emotional.